Radar is an excellent item of kit to have on board a craft – but only if you really know how to maximise its potential The one day RYA Radar course helps you to understand how radar works and make the most of it for collision avoidance and navigation. Radar has a variety of uses including navigation and collision avoidance, indeed the ColRegs state that you must use all means available to you to avoid the possibility of a collision. Therefore, if your craft is fitted with a Radar then you must use it and by implication know how to use it to its full potential, getting the most from a radar is a matter of understanding its potential and being able to ‘set it up’ and modify the settings for the conditions you are experiencing. Typically 4 – 6 students per instructor. What does the radar course cover? 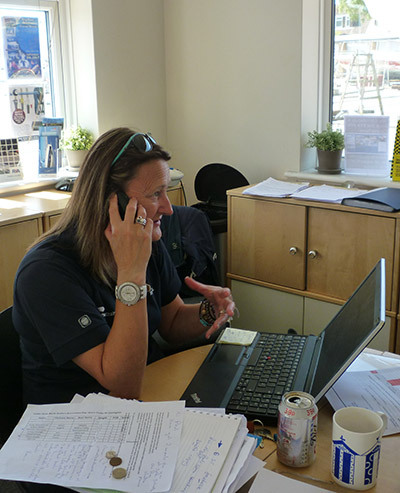 Why choose Powerboat Training UK for your radar course? The simple answer is our instructors. Our instructors have current, real, hands on experience of using radar in fast and slower power driven vessels and vessels on passage under sail all over the world and their experience of using the the radar for collision avoidance and and for navigation makes for a really beneficial and enjoyable course. As a professional full time school our classrooms are well equipped and dedicated to the running of these courses so have all of the materials expected so that we can run first rate courses. The aim of the course is to teach students to use small boat Radar to assist decision making in navigation, pilotage and collision avoidance.